HUDS Daily – Where Real Estate Investors Beat Their Competition to the Deals! First to know – Don’t lose bids – Stay up to date on vital info! Whether you a re a real estate Rehabber, Flipper, Investor or Realtor HUDSnag is for you! 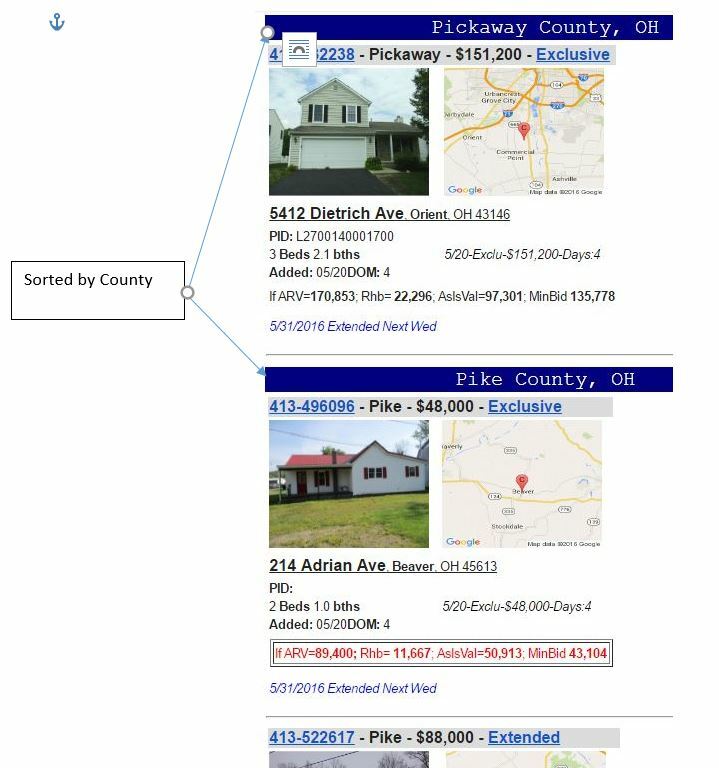 Fast, up to date information with quick alerts on upcoming government sales of foreclosed HUD homes in your area via email every single morning. Beat out your competition by getting your bid in early – don’t lose out on that great buy because you didn’t know all this valuable information. All this in one place and easy to read. Seriously, you need this – read on! Daily morning updates for the county(s) you request of all foreclosed homes currently for sale before Noon. Updates during the day if changes occur or homes are added. Lists sorted by State and County for easy organizing. 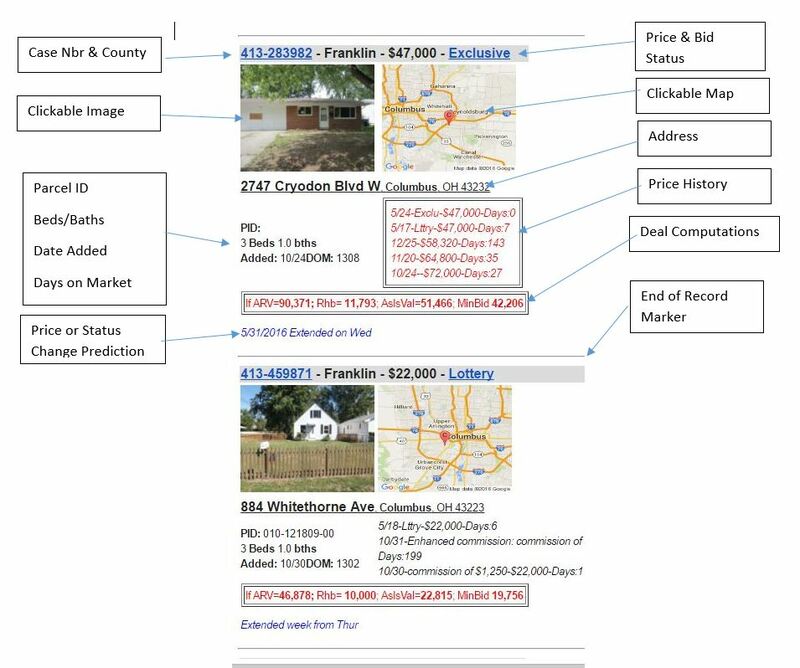 Asking price, opening bid, auditor value, average rehab cost, estimated sales price, the property parcel id number, county, state, status of sale and more to help you decide if this deal is right for you. PID = Property Parcel or ID number. Then a short description of rooms. Then you see “Added” which is when it was added to the system. DOM (Days on Market) that would be a good indicator that price will drop, perhaps several times so you need to watch that in case it is something you like. There is no rhyme or reason why a home sits for days, it is just a slow government process. But be sure to closely look at home and try to determine why it stayed on the market for so long without a sale or successful bid, is there something wrong or rehab too expensive. The sentence below the address starts “If ARV (After Repaired Value)” telling you the estimated value as drawn from multiple sources. Then Rhb (Rehab) gives you an average rehab cost. Some houses will be higher and some lower, but this is the average. Be sure you thoroughly check the house to decide what your rehab costs will be and adjust figures accordingly. AsIsVal (As Is Value) estimates the current value without the rehab. MinBid (Minimum Bid) is the value using the above figures to estimate the Minimum Bid acceptable by HUD at this point in time. Of course, you hope to go lower but we estimate that this figure is the minimum bid needed to win IF the house is in the “Extended” status. Remember bids are taken everyday and can be accepted or rejected by midnight so you need to be ready. Thus when a property is of interest, go see it while it is still in Exclusive or Lottery, evaluate it and then sit back and watch the system for the Red Alert showing it turned Extended and place your bid now. Now look to the right column where it shows a Date, status, price and DOM. The top line is the current data. Those below are the historical price or status changes. If it shows Exclu or Lttry you can’t bid yet but keep your eye out as something is happening here. When HUDSNAG sees that things are moving towards all the right figures this section will turn red and have a box around it. This is a Red Alert, you need to seriously look at this house and either bid, pass or rule it out. Bids must be done through a realtor or broker (better as might be able to negotiate the commission they receive, remember you will likely relist and buy thru them again) so you will need a realtor who can work with you and quickly in order to get your bid submitted properly and in time. Sometimes you will see several days shown with various changes. Perhaps the house was priced too high, so they lowered price, or no one bid, just keep your eyes on this box and learn to understand what it means. This is how you get the jump on the competition. Be sure you have already seen the house, done your own evaluation and have the realtor lined up so you can bid and win. These Red Alerts really make a difference, they keep you alerted and able to move quickly. You won’t find this anywhere but HUDSnag. Of course, you can try to find all this information elsewhere but you won’t find it quickly and all in one place plus easy to read. Nor will you find it in your email or phone text daily unless you subscribe to HUDSnag. From what we have showed you, how can you lose? We have given you some “helpful insight” into bidding. Whether you are just starting or been rehabbing for years, HUDSnag will make your life easier and more profitable. Remember this information will come every single morning, 7 days a week so you won’t miss anything important. Doesn’t matter if you are on your vacation, at a seminar, sitting by the pool, in the car or just working in the office – there it is, every single day! Did you see Chenoweth has dropped in price as predicted! somebody should pick that one up today. JLongHUDS on HUDS Daily – Where Real Estate Investors Beat Their Competition to the Deals! Mr WordPress on HUDS Daily – Where Real Estate Investors Beat Their Competition to the Deals! Copyright © 2019 HUDS Daily. Theme: Himalayas by ThemeGrill. Powered by WordPress.